He says that he is “inherently gloomy about the prospect of Africa” because “all our social policies are based on the fact that their intelligence is the same as ours – whereas all the testing says not really”, and I know that this “hot potato” is going to be difficult to address. His hope is that everyone is equal, but he counters that “people who have to deal with black employees find this not true”. He says that you should not discriminate on the basis of colour, because “there are many people of colour who are very talented, but don’t promote them when they haven’t succeeded at the lower level”. He writes that “there is no firm reason to anticipate that the intellectual capacities of peoples geographically separated in their evolution should prove to have evolved identically. Our wanting to reserve equal powers of reason as some universal heritage of humanity will not be enough to make it so”. Despite the public outcry, there was nothing new to the idea. This is an idea that needs confronting and when the public and the scientific community were offered this high profile opportunity for such, they dropped the ball. The main point of this post is that censoring Dr. Watson, rather than confronting him in debate on the science, was a mistake. Almost as soon as the words were printed Watson backed up, denying that there was true evidence for such a disparity in intelligence; but really there wasn’t a lot of discussion of the ‘science’ of what Watson and so many others (some from unexpected places) claimed. There was simply indignation and alarm and then Watson’s suspension and finally resignation. Closer now to 80 than 79, the passing on of my remaining vestiges of leadership is more than overdue. The circumstances in which this transfer is occurring, however, are not those which I could ever have anticipated or desired. This week’s events focus me ever more intensely on the moral values passed on to me by my father, whose Watson surname marks his long ago Scots-Irish Appalachian heritage; and by my mother, whose father, Lauchlin Mitchell, came from Glasgow and whose mother, Lizzie Gleason, had parents from Tipperary. To my great advantage, their lives were guided by a faith in reason; an honest application of its messages; and for social justice, especially the need for those on top to help care for the less fortunate. But the way this entire ordeal went down doesn’t seem like an appropriate way to advance race relations; to advance science. It has become clear that human populations are not unambiguous, clearly demarcated, biologically distinct groups. . . . Throughout history whenever different groups have come into contact, they have interbred. The continued sharing of genetic materials has maintained humankind as a single species. . . . Any attempt to establish lines of division among biological populations is both arbitrary and subjective. But that politically correct position misses the point I imagine. It is true that the genetic variability between individuals is greater than between “races” or geographically grouped peoples. But, we wouldn’t expect anything else. 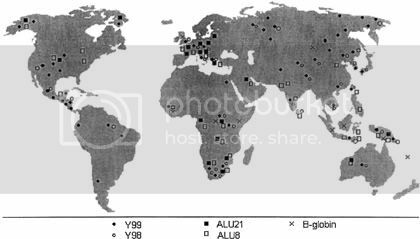 And the fact is that there is considerable, predictable genetic differences between geographically defined human populations. [W]e asked what is the probability of allocating an individual to the correct continent, on the basis of her or his genotype. Different statistical methods gave somewhat different results, but three conclusions appear justified: (1) most individuals are allocated correctly, but (2) the rate of misclassification is never < 27%, and (3) the rate of misclassification is roughly the same, whether allocation is based on autosomal or Y-chromosome polymorphisms, although for the latter the variance among continents is four times as large. True the confidence interval in defining where your lineage hailed from can be wide, and clearly I am nearly illiterate on the subject myself. My ignorance being admitted, there looks to be pretty considerable genetic variability amongst geographic populations. No surprise. Indeed, to step into a minefield, the geographic variability seems to be greatest between Africans and non-Africans. [F]or an allele with a frequency of 20 percent or greater in one racial group, the odds are in favor of seeing the same variant in another racial group. However, variants with a frequency below that level are more likely to be race-specific. This race-specificity of variants is particularly common among Africans, who display greater genetic variability than other racial groups and have a larger number of low-frequency alleles. These low frequency alleles even if some day identified with the genetic component of intelligence, might not be able to explain a large portion of the “intelligence gap,” because they are low frequency in the population. That aside, let’s get back to the discussion at hand. Even though Dr. Watson chose the word “race,” he could’ve just as easily substituted “geographically defined populations” and maintained his point. Isn’t this variability amongst geographic populations enough to make his claims worthy of discussion? Should we be censoring science topics that cross some ill defined line? The reactionary denial of the existence of “race,” as a biological reality, is a matter of semantics in this case. That was the largest argument I heard in the media and amongst the public. 3) the differences can be explained by nurture and so there is no reason to look to nature. These were things that needed to be discussed out in the open as an educational resource. Instead you found them on obscure science weblogs or in journals. The headlines revolved around Watson’s comments and not the articulate and insightful responses, which were too few before the discussion was cut off prematurely by those who broke ties with Dr. Watson. Let’s pick up these three arguments by looking at the “intelligence gap.” Ignoring the heterogeneity amongst the data and the complaints above, there appears to be a persistent and relatively consistent difference on numerous different tests of intelligence amongst geographically disparate populations and amongst “races” within western countries. In the United States, the mean IQ score among Blacks has at times been measured as approximately 85 and the mean IQ score among Whites has at times has been measured as approximately 100; the mean IQ score of Latinos has been reported to be measured as approximately 89 for unspecified dates. The mean score for people of East Asian and Jewish descent is usually higher than the mean score of Whites. That said, best evidence says that within populations (and “races”) intelligence is at least 50% hereditary. An APA report in response to The Bell Curve said that intelligence amongst the Caucasian “race” was 75% hereditary; and indeed some studies put the number even higher. As pointed out the genetic variability between “races” is much less than between individuals within a “race.” And so we get the question, can any of the differences in measured IQ between “races” be explained by genetics, as it can so easily between individuals? The relationship of the g factor [ed: the hereditability of intelligence] to a number of biological variables and its relationship to the size of the white-black differences on various cognitive tests (i.e., Spearman’s hypothesis) suggests that the average white-black difference in g has a biological component. Human races are viewed not as discrete, or Platonic, categories, but rather as breeding populations that, as a result of natural selection, have come to differ statistically in the relative frequencies of many polymorphic genes. Critics of the idea of a genetic basis for the “intelligence gap” have a number of criticisms of such. I’ve laid out three of the big ones above. First, the world cannot point to a polymorphism; an allele with increased frequency, that could explain in any part the “intelligence gap.” But this may merely reflect how far we have to go in understanding the genetic influences on intelligence. It certainly isn’t an argument that the link between “racial” genetic differences and intelligence couldn’t exist. Second, there is considerable debate over the both the nature of “intelligence” and potential biases in trying to measure it. Moving away from the new age ideas of multiple intelligences, it should be noted that the most conservative and standard IQ tests correlate well with a whole host of real world performance measures; including performance in school. While there are potential cause and effect questions here, the psychological community continues to accept IQ as a measurement of largely inherent cognitive ability. Test bias towards the cultural and educational experiences of whites has been dismissed by the APA. But that should be no surprise considering their money in the pot on this issue; it is their members creating the tests. Despite that, it is worth reading Neisser’s 1996 report on intelligence which covers, in fairly layman’s terms, far more the potential for measurement bias. Non-epidemiological studies exist which try to demonstrate bias in intelligence testing. A recent one published by researchers at Case Western Reserve University showed a bias in favor of knowledge typically held by whites. [P]roblems were only solvable on the basis of specific previous knowledge, knowledge such as that tested on conventional IQ tests. Such specific knowledge did vary with race and was shown to be subject to test bias. Differences in knowledge within previous termanext term race and differences in knowledge between races were found to have different determinants. Race was unrelated to the g factor. Without having delved in to the methodology of the major research and obviously not being terribly well versed in the psychology or biology of intelligence (or sociology or racial studies, etc.) some of the evidence I find interesting is studies of adopted children, assumingly adopting the culture of their trans”racial” parents, at least in part. Take this famous Minnesota adoption study, which looked at children adopted by “advantaged” white couples. Certainly this study, at least on its surface, appears to point to a multi-etiological explanation for the gap but it also sheds light on the idea that cultural bias plays a large role in explaining the “intelligence gap,” considering its persistence even in the midst of a very different social construct. Straying from the “hard” science, some racial theorists find that specific forms of racism reinforce poor African-American performance on IQ tests (at least in this country). Notable amongst these theories is one known as stereotype threat, which may be contributing to black performance on IQ tests. It is the fear that one’s performance will reinforce socially held stereotypes. That fear can hamper peak performance. Suppose that I measure the heights of adult males in a poor Indian village beset with nutritional deprivation, and suppose the average height of adult males is five feet six inches. Heritability within the village is high, which is to say that tall fathers (they may average five feet eight inches) tend to have tall sons, while short fathers (five feet four inches on average) tend to have short sons. But this high heritability within the village does not mean that better nutrition might not raise average height to five feet ten inches in a few generations. Similarly, the well-documented fifteen-point average difference in IQ between blacks and whites in America, with substantial heritability of IQ in family lines within each group, permits no automatic conclusion that truly equal opportunity might not raise the black average enough to equal or surpass the white mean. But this isn’t an entirely appropriate criticism, several researchers, and indeed The Bell Curve, have found that the “intelligence gap” persists even between members of “races” with similiar education, living conditions and socioeconomic status. True you can never control in entirety for environmental factors and The Bell Curve has its many critics for its efforts in that area. For instance, some argue that black and white educations in America are never equivocal based on everything from institutional racism to the economic viability and resources of the schools the different “races” are likely to go to. And this may play a part, although it does little to explain the “intelligence gap” between whites and those of Asian lineage. Another environmental factor to consider is that there is some association between IQ and economic status. It appears, and reasonably so, that the long held belief is that intelligence begets your economic advantage and not the other way around. That being said, some studies have clearly found otherwise. One study published in Child Development by Jeanne Brooks-Gunn and others attributed upwards of 80% of the “intelligence gap” to socioeconomic factors, even as other researchers (trying to control for such factors) have found the gap persists. Finally, there is some compelling circumstantial evidence for environmental factors in what is known as the Flynn Effect. 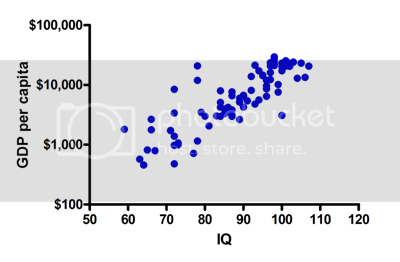 The Flynn Effect is the fact that IQ is rising, amongst virtually all populations and has been doing so in a pretty linear fashion since IQ testing came into place. In an influential series of papers, Flynn showed that the increasing raw scores appear on every major test, in every age range and in every modern industrialized country. (The rise itself is now often called “the Flynn effect.”) The increase has been continuous and roughly linear from the earliest days of testing to the present. On broad-spectrum tests such as the WISC and the WAIS, Americans have gained about 3 IQ points per decade, or 15 points over a 50-year period. It is interesting to compare this total with the much-discussed gap between the mean test scores of Caucasian and African Americans, which is also about 15 points (one standard deviation of the IQ distribution). Given that the IQ of the population as a whole has increased by a similar amount just since the 1940s, that gap does not seem so large. What is interesting is that, since the late 1990s some western European studies have found that this trend is slowing or has stopped for their populations. Other studies have shown that the growth continues for minorities in industrialized countries and may even be increasing for some in the developing world. The Flynn Effect may have two major contributions to the debate. First, Dr. Flynn, on initially documenting the trend, presented it as evidence that IQ tests did not measure something with any level of innatness and indeed had no real practical application in defining cognitive ability. Despite the tests association with real world achievement and success, the Flynn Effect may demonstrate the inherent flaws in trying to even measure an ‘intelligence quotient’. Second, and perhaps more importantly, the rises in IQ are obviously too fast to be explained by genetics. The Flynn Effect bodes well for the contribution of the environment to IQ. And indeed, if some of the scattered data is correct in implying that third world nations may be seeing a faster rise as their conditions improve, we may soon see that environment and not genetics (as Dr. Watson rambled about) is responsible for the “intelligence gap.” Not that the two are mutually exclusive. With all that laid down, I hope its obvious that however politically incorrect there is a legitimate debate here. In no way do I agree with what Dr. Watson said, but the way he was handled did nothing to further the course of science. Scientists should never be censored. Should there really be a red line between ‘acceptable debate’ and ‘unacceptable debate’? And if someone crosses the line into ‘unacceptability’, should they be silenced? In the past, science museums and institutions might have encouraged open and rigorous debate about scientific questions; now they seek to shut it down. [S]ilencing Watson is no way to counter his ideas. Recent history should teach us that it is only when views such as Watson’s are exposed to a thorough critique that we can clear the air. In 1994, Richard Herrnstein and Charles Murray published their notorious book The Bell Curve, which argued that significant differences existed in IQ between blacks and whites in the US. Its authors claimed that attempts to improve blacks’ relatively poor IQ in comparison with whites’ IQ had failed, and called for an end to welfare programmes that supported low-income women with children. The book sold over 400,000 copies, and in the furore that followed the American Psychological Association (APA) was compelled to convene a task force to restate its position on the issue. Silencing the controversial, and as seen unfounded, positions of those who promote these types of views is no way to clear the air. There will always be the notable who put their foot in their mouth and the best way to deal with it is to confront them, not sweep them under the rug.